It’s truly like God’s put an intern in charge of deaths and he’s going through the list of celebrities people really love. RIP Terry Wogan. How apt. Bowie went a couple of weeks ago and now Sir Terence of Wogan has popped his clogs. I can’t think of many more revered personalities than Terry Wogan; he was a guy who always came across as a witty, likeable guy. He was, in my view, the greatest ever radio performer. People often use the statement ‘it was as if he was talking directly to me’ when they talk of certain radio people; it was certainly true of Wogan. Everyone out there in Gramblerland probably has their favourite Wogan. Was it the quizmaster in Blankety Blank who would make jokes about how naff the prizes were? Was it the host of Children in Need who managed to keep the whole thing from turning into a shambles? One of Stewart’s annual highlights was the Eurovision Song Contest. Wogan was the voiceover man and it was his comments which kept you watching. Until Wogan took over the job of presenting, the song contest had been treated as a very serious programme. The presenter would simply introduce the acts from the various countries, but wouldn’t comment otherwise. Terry saw it differently. He realised that it was a dreadful programme with awful songs from around Europe and told you so. If he thought a song was crap, he didn’t hold back. If any other presenter had tried the same thing, he would probably have been sacked for insubordination. Not Wogan. It says something for his technique that he was allowed, even encouraged, to basically take the piss out of the whole thing. It also says a lot that his replacement in the role, Graham Norton, is encouraged to continue the piss-take approach. My own favourite Wogan was the story teller. Especially when he read the Janet and John stories. If you haven’t heard them, believe me, they are hilarious. The stories are supposedly about his sidekick, John ‘Boggy’ Marsh who read the news on Wogan’s radio programme. They were written by Mick Sturbs (probably not his real name) in the style of a primary one reading book, hence the title of a collection of the stories being published with the title ‘See John Run.’ The premise of the stories was always that John, portrayed as being like a small inquisitive child, would meet someone and have a chat which he then recounted to his wife Janet. However, John’s retelling of the encounter turned from something quite innocent into something absolutely filthy. An example was when he met a lady who was going on holiday to the seaside and was looking forward to the local delicacy of whelks cooked in scrumpy. John’s retelling had her desperate to get a few winkles in cider. Another had him taking his secretary for a meal. She was very excited about him taking her to a very posh London restaurant called ‘The Oxo Tower’. John’s telling of the story altered slightly when he told Janet that his secretary was looking forward to him taking her up the oxo tower. Every story ended with John suffering the wrath of Janet. These stories were read out by Wogan on his ‘Wake up to Wogan’ radio show. I used to hear them while driving to work. You could always spot fellow listeners, especially if you were stopped at lights when the double entendre laden part of the story was being read - They were the ones wiping tears of laughter from their eyes. Any birthdays to celebrate this Saturday, the 6th of February? Quite likely, one or two. Christopher Marlowe 1564 (Came up with better one liners than his contemporary, Will Shakespeare. How about this one? ‘Who ever loved that loved not at first sight.’ Put a comma after that and its meaning changes. Much better. ), Henry Irving 1838 (Ectaw, dear leddie. ), Eric Partridge 1894 (Who? He only wrote the greatest book aimed at would-be writers. It was called Usage and Abusage. ), George ‘Babe’ Ruth 1895 (Basebally bloke. ), Ramon Novarro 1899 (Star of silent films. Died in unusual circumstances which certainly can’t be discussed here; especially the ‘urban legend’ version. There, that’s got you intrigued. ), Ben Lyon 1901 (US actor who settled in Britain and had hit radio series Hi Gang and Life with the Lyons. ), Ronald Reagan 1911 (B movie actor. ), Eva Braun 1912 (Inventor of the electric shaver [Some mistake, surely. - Ed.]. ), Zsa Zsa Gabor 1917 (99 today, has been married nine times, Dahlink. ), Patrick McNee 1922 (Trivia: He was expelled from Eton for bookmaking. ), Dennis Norden 1922 (If you’re... the kind of... person... who enjoys... the faltering style... of a nonogenarian... rambling on... about... people who are... dead... you are probably... in a... minority... of... one. ), Billy Wright 1924 (Footbally bloke married to the Beverly Sisters. ), Freddie Truman 1931 (Crickety bloke. Ah’ll sithee. ), Rip Torn 1931 (Actor with daft name. ), Francois Truffaut 1932 (Didn’t think much of the British film industry: ‘Well, to put it bluntly, isn't there a certain incompatibility between the terms cinema and Britain?’), Leslie Crowther 1933 (Cu...hum on down! ), Jimmy Tarbuck 1940 (Factoid: The first time Tarbuck’s name was mentioned in the press was when he was up in court for stealing Tery-Thomas’ cigarette holder. ), Bob Marley 1945 (Scrooge’s sidekick), Kate McGarrigle 1946 (Dancer with bruised knees. ), Manuel Orantes 1949 (Tennisy bloke), Mike Batt 1950 (Womble), Natalie Cole 1950 (Rhyming slang), Simon Phillips 1957 (Played drums for the dog in The Wizard of Oz. ), William Bailey 1962 (Who? Oh, Axl Rose which is an anagram of oral... Really? ), Rick Astley 1966 (Anagram of take lyrics), Tim Sherwood 1969 (Footbally bloke. Anagram of swim the door) and Darren Bent 1984 (Footbally bloke. Anagram of bred tanner [Please stop this now. - Ed.]. 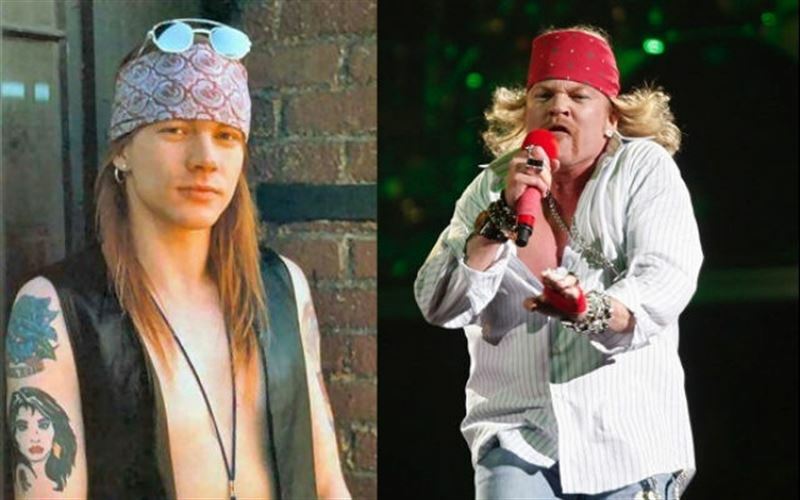 Before leaving the birthdays, I thought you might like to see what Axl Rose looks like now. That really is the older version of the guy on the left. It isn't Keith Lemon. Although, there does appear to be a bandage on his left hand. Before last week’s grambling results, can I just wish the boys from Polomint City the best of luck in tomorrow’s cup clash against Celtic? The way Celtic have been playing lately (badly), could EK pull off the greatest cup upset ever? Doubt it, but I can still hope. Tom Hopper latched onto a loose ball in the box to hammer home from 10 yards for the opener on nine minutes. Murray Wallace then headed a 61st-minute second into the bottom corner. Adam Armstrong's late penalty gave City hope after James Maddison was brought down, but the home side then had Romain Vincelot sent off in injury time. In a game of three penalties, Brad ‘I’m free’ Inman put the Alex ahead on 59 minutes after George Cooper had gone down under goalkeeper Jordan Archer's challenge. Lee Gregory then levelled from the spot five minutes later after Byron Webster was fouled by Crewe keeper Ben Garratt. But, when Oliver Turton handled late on, Gregory missed a chance to win it, firing his penalty against the post. Pillock! Wigan took an early lead when Yanic Wildschut's cross-shot was turned into his own net by defender Richard Duffy. The Latics' second came from Will Grigg penalty's after Vale defender Ryan McGivern had been sent off for fouling the striker in the box. Grigg secured his brace and the points in the 69th minute when he slotted past Vale goalkeeper Jak Alnwick. The Dons twice led in the first half, through David Fitzpatrick's 20-yard strike and Tom Elliott's volley. But Jack Compton levelled on both occasions, running through to slide home and curling in a free-kick from out wide. And the winger sealed his treble from the penalty spot after substitute Kevin Dawson was fouled by Callum ‘Ochone ochone’ Kennedy. So, a pretty crappy week for The Grambler. What can he/she/it do this week to make amends? [Don’t bother giving us a prediction? - Ed.] Here are the predictions for the 6th of February; all games kicking off at 3pm. Will this be The Grambler’s week? I doubt it. Teaser time. Yay! Last week I asked you which was the first team to use the name United. The answer was the team known as the Blades, Sheffield United, founded in 1889. What about a teaser for this week? Earlier in this week’s edition, I mentioned East Kilbride (a non-league club) playing top of the SPL side Celtic in the fifth round of the Scottish Cup. Not many non-league teams get that far in the Scottish Cup or the FA Cup. However, in the early days of football in Britain it was possible for a non-league to actually win the competition. This week’s question, therefore, is - which non-league club was the first to win the FA Cup? And finally, Cyril? And finally Esther, I am indebted to a Mr T. Wogan who reads us a lovely story to end this week’s (g)ramble. Click here and enjoy.